As a mom, my top priority is the well-being of my family. I want quality products and at the same time, I also want value for money. I am always on stand-by for in-store sale and promos. 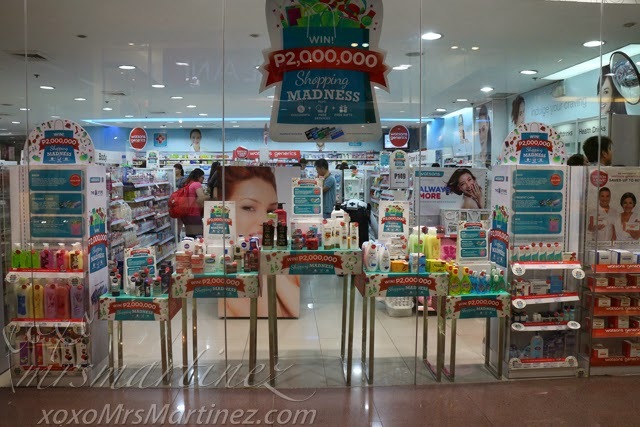 When I saw Watsons & The SM Store Beauty Section "Shopping Madness" promo ad in the newspaper this morning, I visited the nearest Watsons branch right away. I don't want to be left behind, who knows I might be that one lucky mom who will take home over Php 2 million worth of shopping points, tax free! The huge store window greeted me at Watsons SM City North EDSA. It displays all the products with qualifier sticker on. 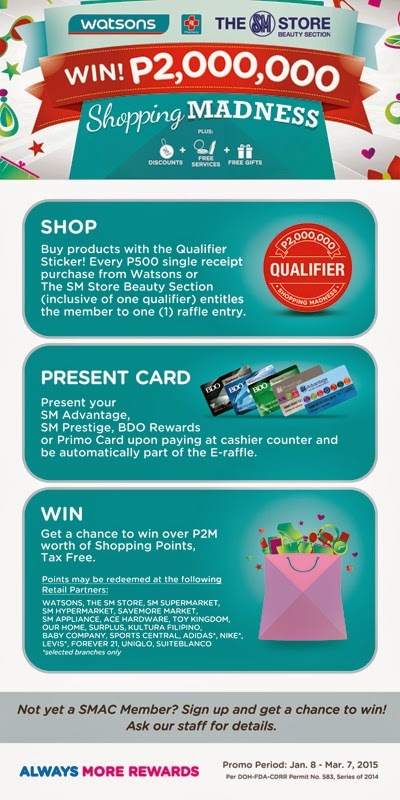 Every Php 500 single receipt purchase from Watsons or The SM Store Beauty Section (inclusive of one qualifier) entitles the member to one (1) raffle entry. It's great that I remembered to bring my SM Prestige card. 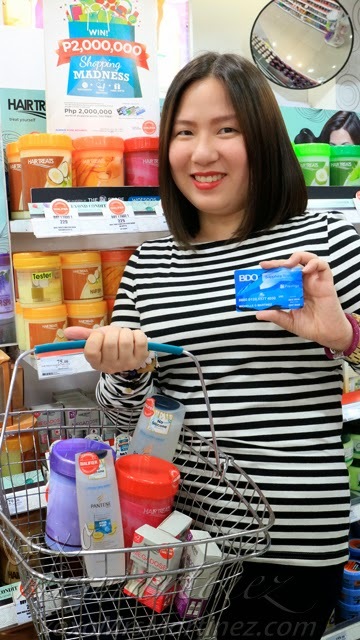 It is one card that does almost everything for me- earn points and pay for my purchases. 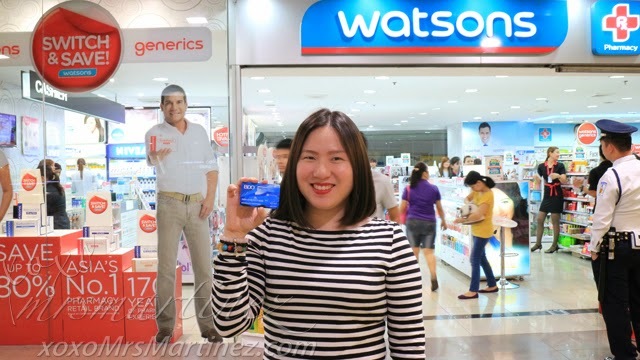 Watsons & The SM Store Beauty Section Shopping Madness promo is also open for SM Advantage, BDO Rewards or Primo Cardholders. 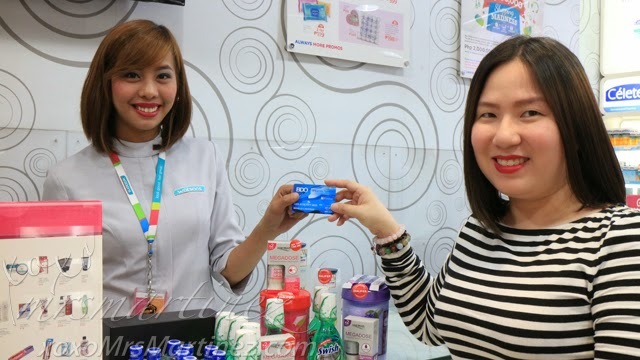 Simply present your card upon paying at the cashier counter and be automatically part of the E-raffle. 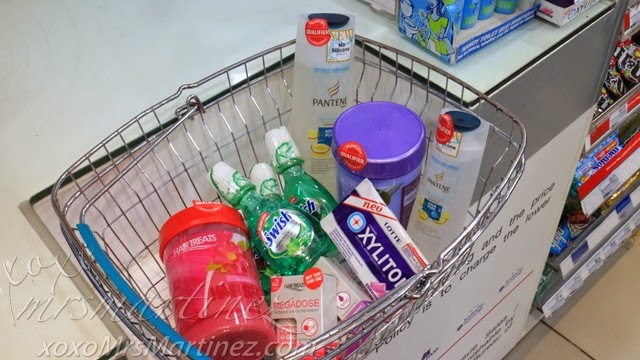 Watsons is a shopping haven for moms like me. This store has everything my family needs from medicines to personal care products. I can't get enough of its Switch & Save products that I hoard to share with family and friends. I also can't resist its Buy 1 Take 1 and Buy 2 Take 1 promos with prices ranging from Php 149 to Php 269 only. I know I save a lot of money every time I shop at Watsons. The mechanics were simple. While shopping, I looked around for products with red round stickers and the word QUALIFIER printed in bold letters. Since I am a mom who works hard for her money, I also bought several Buy 1 Take 1 and Buy 2 Take 1 products with Qualifier stickers on it. My SM Prestige card took care of paying for my purchase. By presenting it also entitles me to be automatically part of the E-raffle. And just like that I now stand the chance to win over Php 2,000,000 worth of shopping points, tax free. 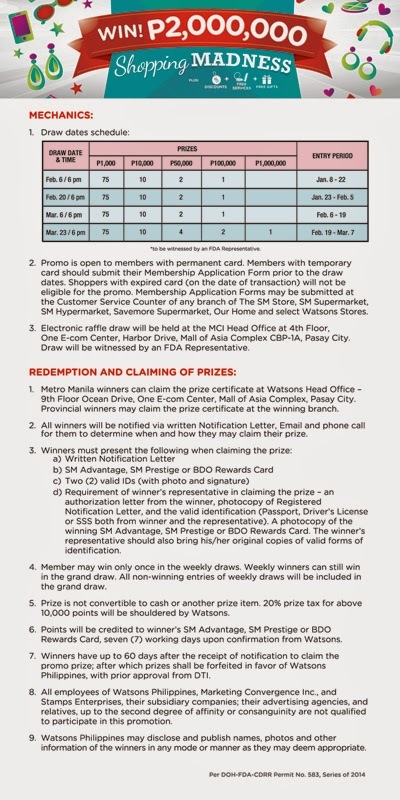 If I win, I can redeem my points at the following Retail Partners: Watsons, The SM Store, SM Supermarket, SM Hypermarket, SaveMore Market, SM Appliance, Ace Hardware, Toy Kingdom, Our Home, Surplus, Kultura Filipino, Baby Company, Sports Central, Adidas*, Nike*, Levis*, Forever 21, Uniqlo and Suiteblanco. What are you waiting for? Hurry to the nearest Watsons or The SM Store Beauty Section today! Promo is until March 7, 2015.